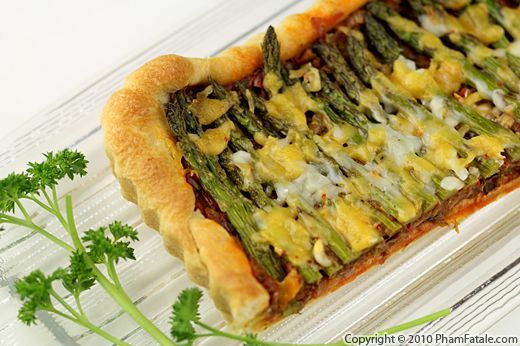 Place the dough in a non-stick rectangular (12" x 8") tart mold, previously lined with parchment paper, following the curve of the mold, crimp the dough against the edge. Leave a little excess above the edge because the dough will settle a bit in the oven. Prick the dough with a fork. Chill in the refrigerator for about 20-30 minutes. Line the dough with another sheet of parchment paper and top with ceramic pie weights (or dried beans). Place the tart pan on a baking sheet and bake for about 12-14 minutes. Allow to cool to room temperature. Remove the pie weights and discard the pieces of parchment paper. Set aside. Note: With the dough remnants, I decorated the tart with 2 leaves made from the dough that I placed at the edges of the pan. Just cut the dough into the shape of a leaf and create the veins using the back of a paring knife. Discard the stalk and thinly slice the fennel bulb. In a large, non-stick pan, heat about 2 tablespoons of oil. Add the leeks. When the color is translucent, season with salt. Add butter and fennel. Stir-fry the fennel and cook until slightly browned (about 5-7 minutes). Add the tomato chutney and puréed red bell pepper. Bring to a boil, then lower the heat to medium-low. Cook for about 10 minutes until thickened. Adjust seasoning. Roasting the asparagus: Preheat your oven to 400°F. Trim about ½ inch from the root of each asparagus. Line a baking pan with a sheet of parchment paper or aluminum foil. Brush with olive oil. 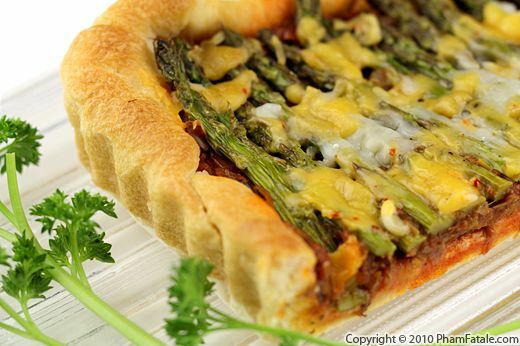 Spread the asparagus on the baking pan. Drizzle with lemon zest and more olive oil to coat the asparagus. Toss well. Season with salt and pepper. Roast for about 10 minutes, tossing half-way through the cooking process for even roasting. Drizzle with half the lemon juice. 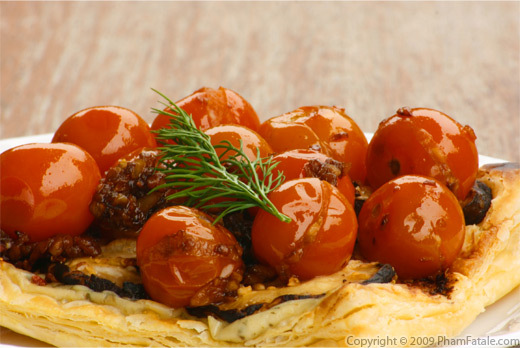 Fill the tart shell with the warm tomato chutney filling. Top with the roasted asparagus. Finish with a sprinkle of jalapeño Cheddar cheese. Bake at 375°F for 10 minutes and then broil for about 2-3 minutes to get a nice golden top. Remove from the oven and allow to rest for at least 10 minutes. I used store-bought Pillsbury crescent rolls as the pie crust. 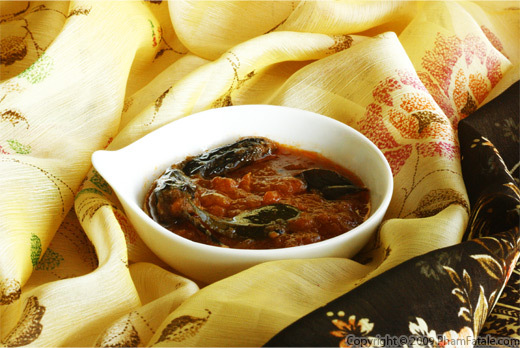 If you have the leftover tomato chutney, you could use it as the base for tomato pasta sauce or as spread for crostini. 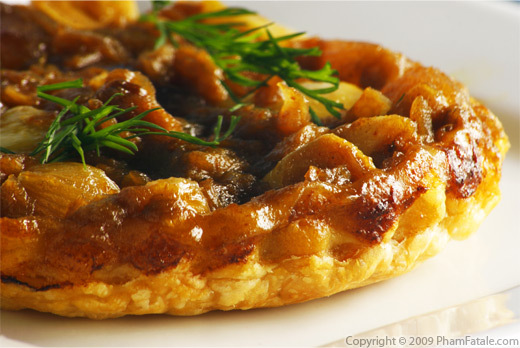 You can check out my other Indo-French fusion savory tart: dopiaza tatin tart. I used California jalapeño Cheddar for color. If you want to keep the French theme, you could use Gruyère cheese instead. I used fennel bulb to add an extra licorice flavor. If you don't have any, you could replace it with sliced celery. Published By: Jacqueline Pham on November 30, 2010.